KENNEDY SPACE CENTER, Fla.— Former Space Shuttle astronauts Brian Duffy and Scott Parazynski joined the United States Astronaut Hall of Fame in a star-studded ceremony held on Saturday, May 14, under Space Shuttle Atlantis at the Kennedy Space Center Visitor Complex. With nine missions between them, the duo inducted into the AHoF have an extensive space flight history that made them a perfect fit for the prestigious group they are now joining. These include well-known U.S. astronauts such as John Glenn, Neil Armstrong, Sally Ride, and Jim Lovell. Brian Duffy was born on June 20, 1953. After his formative years, he joined the U.S. Air Force, graduating from the U.S. Air Force Academy in 1975 with a bachelor’s degree in mathematics. Duffy went on to fly F-15s while stationed in Kadena, Japan, before being selected to attend the U.S. Air Force Test Pilot School. After graduation, he was stationed at Eglin Air Force Base in Florida where he served as the director of F-15 tests. Duffy has logged more than 5,000 hours of flight time in over 25 different aircraft. He was selected by NASA to be an astronaut in June of 1985. After completing the prerequisite training period, Duffy roared to orbit with the crew of STS-45 on Space Shuttle Atlantis in April of 1992, where he served as the mission’s pilot. The following year, Duffy once more traveled into the microgravity environment as the pilot of STS-57 on Space Shuttle Endeavour. In January of 1996, Duffy took command of the STS-72 mission on Endeavour. During this flight, extra-vehicular activities (EVAs) were carried out to test hardware and tools that would eventually be used in the assembly of the International Space Station. Duffy’s last mission into the black, STS-92, was flown on Space Shuttle Discovery in October of 2000. During the almost two weeks that the seven-astronaut crew spent at the space station, they attached the Z1 truss, Control Moment Gyroscopes, Pressurized Mating Adapter-3 (PMA-3)—which was mounted on a Spacelab pallet—and two DDCU (heat pipes) to the orbiting lab. In essence, the station’s brain and nervous system were brought aloft during STS-92, a fact highlighted during this weekend’s events. Duffy retired from the U.S. Air Force and NASA in 2001; he went on to work for Lockheed Martin between 2004 and 2008 before working for what would become Orbital ATK. Besides spending time with his grandchildren, Duffy continues to work on space projects. This includes the new rocket that NASA hopes to use to send crews to distant destinations throughout the Solar System—the Space Launch System. Scott Parazynski is a veteran of not only five shuttle missions, but he also conducted seven EVAs. Parazynski stands out among the many accomplished individuals who comprise NASA’s astronaut corps (past and present) in that he is the only space flyer to have also climbed Mount Everest. Parazynski’s life of exploration began July 28, 1961, in Little Rock, Arkansas. He went on to receive a Bachelor of science degree in biology from Stanford University in 1983. He was tapped by the U.S. space agency to be a member of the 1992 NASA group of astronauts. As well as being a trained M.D., Parazynski has a rather heady list of degrees and honors. However, his primary claim to fame, that of being an astronaut, began when Space Shuttle Atlantis launched from Kennedy Space Center’s Launch Complex 39 in Florida on mission STS-66 in November of 1994. Almost three years later, on Sept. 25 of 1997, Parazynski flew aboard Atlantis as he and the crew of STS-86 began the seventh mission to the Russian space station Mir. While rapidly becoming one himself, Parazynski flew with a certified space flight legend on STS-95 when Mercury astronaut John Glenn traveled back into the black on Space Shuttle Discovery. One of Parazynski’s roles on that flight was to monitor Glenn’s health. This is something that, according to Parazynski, made him a little nervous. However, as Parazynski put it, Glenn was in “super” shape. STS-100—flown on the “baby” of NASA’s fleet of orbiters, Endeavour (as she was the youngest of the shuttles)—marked the ninth time that a shuttle ventured to the emerging International Space Station. It served to deliver Canadarm2, which has since become an integral and critical component of the complex. Parazynski’s last mission to space, also to the ISS, was STS-120 on Discovery. It will, perhaps, best be known for the contingency EVA that Parazynski conducted to repair a solar array that had become snagged and damaged while being deployed. Ever the consummate professional, Parazynski successfully completed the EVA. Parazynski, much like Duffy, found out that he would be added to the group close to six months ago during the holidays. We asked Parazynski if he might be considering a return back to space via newly-emerging commercial spacecraft. The ceremony was emceed by former CNN correspondent John Zarrella, a regular host for these events. The Astronaut Scholarship Foundation was formed by NASA’s original Mercury 7 astronauts. In 1990, the organization created the U.S. Astronaut Hall of Fame. Every year since its original debut, the AHoF has honored a new class of space flyers into its ranks. 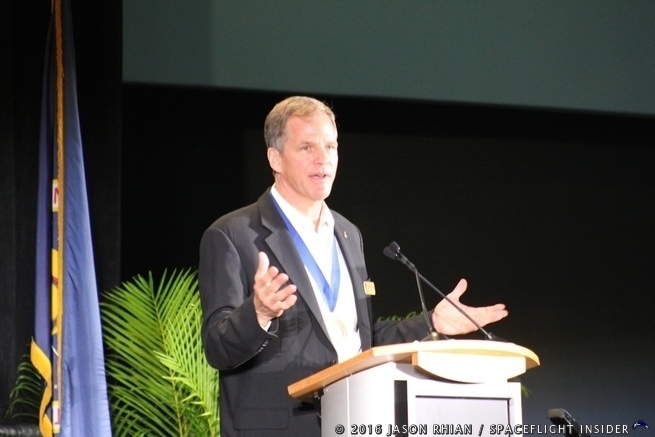 More than 400 invited guests attended this weekend’s events, which kicked off on Friday, May 13, with a gala held at the Saturn V Center underneath the 363-foot long rocket that helped power six crews to the surface of the Moon. Also held in conjunction with this weekend’s ceremony was the ASF’s Scholar Technical Conference. Designed to highlight the number of ASF scholars as well as their accomplishments, the conference shined a spotlight on the efforts of past and present students who have benefited from the ASF’s efforts. 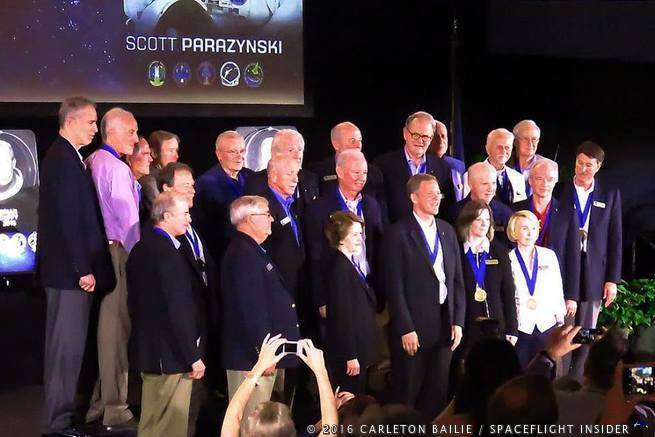 The weekend’s activities culminated in the ceremony where Duffy and Parazynski were inducted into the Hall of Fame at the Kennedy Space Center Visitor Complex’s $100 million Atlantis Exhibit. The ASF’s mission is to provide support to students seeking degrees in science, technology, engineering, and math (STEM). Throughout the course of events leading to Saturday’s ceremony, many hilarious moments were relayed about the duo’s experiences on the ground, in the sky, and on-orbit. “We joke about it, right, about watching the Apollo guys while we were growing up, but they inspired me, they kept my attention and they got me interested in science, engineering, and mathematics and that’s why I’m here today,” Duffy said.